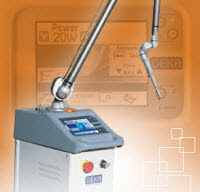 I first saw the Deka laser several months ago at a John Julian implant course and was thoroughly impressed. I'm a technician, but if I were a dentist looking for a laser system, Deka would be a no-brainer. The CO2 feature sets this product above the rest by eliminating bleeding and dehydrating the soft tissue, causing it to retract automatically for impressing. With this baby, packing cord would virtually be a thing of the past!